Do you live in between Palm Springs and Rancho Mirage? That would put you in Cathedral City, California. Are you suffering from water and flood damage in Cathedral City? If you are, contact the professionals at Superior Cleaning and Restoration Inc. today. We can get to the root of your water and flood damage problem. We will come up with a restoration plan that will accommodate your needs. From dry out remediation, to reconstruction and remodeling, Superior Cleaning and Restoration Inc. has you covered. Our cleaning and restoration experts provide superior service, accept many major insurance companies, and are available 24 hours a day, 7 days a week. Don’t try and deal with water damage cleanup on your own, call the professionals at Superior Cleaning and Restoration Inc. now. Call Superior Cleaning and Restoration Inc. to find out. The only way to get an honest estimate on the work needed to restore your property, residential or commercial, is to have one of our trained professionals inspect your property. This is why our operators are available 24/7, because you never know when a flood and water damage emergency might occur. Does Superior Cleaning and Restoration Inc. service all of Cathedral City? We provide our superior service to all of Riverside County, including Cathedral City, California. Our professional cleaning and restoration technicians are here for all of your water damage emergencies. Did you know that Suzanne Somers used to live in Cathedral City? The more you know. But seriously, flood and water damage can ruin a properties value over time. If it remains unchecked, structural damage can occur and cause massive repair bills. Get in touch with the professionals at Superior Cleaning and Restoration Inc. today for a free estimate. We are available for you 24/7, accept many major insurance companies, and offer superior service. 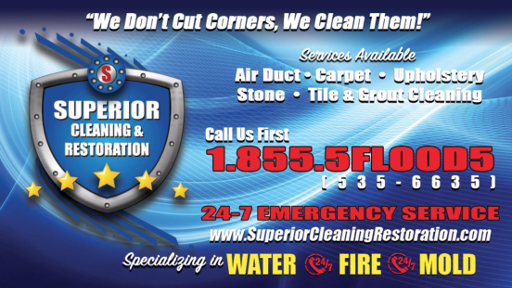 Superior Cleaning and Restoration Inc. will leave your property in a superior state.